Material placed over a roller frame, used to absorb paint and apply it to a large flat surface. 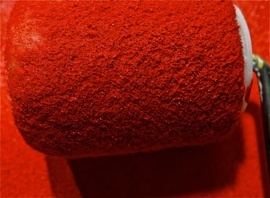 Foam roller covers are best for high gloss or latex paints. They can also be used with oil-based paint, but, ideally, should be used only on textured or smooth surfaces. Synthetic types are best when using a water-based paint. Wool works well for oil-based paints. Both the synthetic and wool versions can be used on any type of surface. Roller covers are not expensive, although all materials used for painting need to be factored into the cost of the overall paint job. Most roller covers are under $15. Wool is usually the most expensive option, followed by synthetic material. Foam is the cheapest.